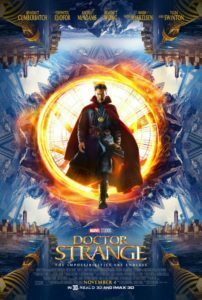 Doctor Stephen Strange (Benedict Cumberbatch) is an exceptionally brilliant surgeon, his rock steady hands carrying out the orders of his whip smart brain with precision in his field of neurosurgery. It is a peerless combination that brings Strange a notoriety that he covets and refuses to risk on cases that he views as irredeemable. A failed case will not bring ‘oohs and aahs’ from those beneath him. It does not matter to them that the situation was impossible to begin with. As astonishingly adept as Strange is, he is equally arrogant, treating his staff with contempt and his fellow surgeons with utter disdain. So losing function in both hands in a high speed car wreck is a cruel irony that brings Strange scant sympathy from all bar Christine Palmer (Rachel McAdams), a colleague and ex girlfriend who knows Strange better than almost anyone, but even she cannot gain an invite to the self destructive pity party that Strange is hosting on his lonesome. Finding no surgeon as capable as him, Strange decries medical assistance and heads to Nepal for spiritual saving. It is there that he finds The Ancient One (Tilda Swinton) and learns the true power of the mind. After the initial and inevitable scepticism, Strange finds that he has a knack for matters of mysticism and magic. A good thing too, because a rogue ex student Kaecilius (Mads Mikkelsen) has formed a pact with others even more evil, with a plan to… well let’s just say what he wants to do isn’t very nice. Doc Strange isn’t really that groundbreaking, but it is quite different when compared with its caped companions within the Marvel universe. In fact the physical manipulation of worlds evoked memories of Inception, and the dynamic between The Ancient One and Strange obviously has parallels with The Matrix. Of course with all of that Marvel money the film looks sensational, with some early parallel reality sequences being appropriately trippy, and the final showdown that takes place in an un-exploding environment extremely effective. And by un-exploding I mean it was exploded, but the process is reversing… you’ll see. It also spends more time than usual building the world – in this case a world filled with more magic than might. The cast is typically Marvel-lous, with Chiwitel Ejiofor, Benjamin Bratt and Benedict Wong accompanying the names above. Tilda Swinton in particular seems to enjoy her Morpheus style role, with her expressionless demeanour and pithy delivery of weird dialogue a highlight. In fact the film benefits from humour, and while it lacks laugh out loud moments it remains constantly chuckle-worthy, with interactions between the stubborn Strange and the peaceful Nepalese ‘staff’ designed for numerous friction. Despite the humour, the cast and the money, Doctor Strange seems more a placeholder, a stepping stone to another crossover or Avengers All Star bash. By eschewing the Marvel template it does provide a different experience to the more recent ennui of the Avengers and Cap America sequels, but it ends with a competent but never superlative experience. Maybe he is keeping the rabbit in the hat until the next film. As this is ultimately an origin story Doctor Strange can’t further the mythology too much just yet, that will inevitably come to a popcorn emporium in the near future. Final Rating – 7.3 / 10. Better than just ‘worthwhile’, but I continue to believe that Marvel can do more with their billions.